“Public space is a place of social interaction as well as key for the identity and landscape of the city. As a common good, it belongs to all inhabitants and it has a systemic relation with other common goods such as culture or education”. In 2016 the international art competition Artes Mundi selected ‘Seed Journey’, produced by the collective known as Futurefarmers, for inclusion in the short list of six art works, which were displayed in the National Museum of Wales (Fig 1). Futurefarmers is interested in using art as a vehicle to encourage preserving ‘the commons’ which are globally defined as land use, biological matter and the sharing of knowledge. The ‘Global Commons’ refers to resource domains or areas that lie outside the political reach of any one nation State. Seed Journey connects up these commons through the voyage of the seed carrying vessel Christiania. Its mission is to return historically important packages of rediscovered cereal seeds from Europe to the Middle East, where they were first selected and handed on from farmer to farmer so initiating the neolithic revolution. This retro-voyage touching on all three commons has become a “laboratory” where the collective continues its research into accessing the global commons. In this context, the Artes Mundi installation of Futurefarmers became an interactive “base camp” and visitors were invited to become part of the journey and to consider the possibility of working in common to promote local social change and different futures. Therefore, Seed Journey can be seen as a gesture towards the relatively recent cultural departure of humanity from self-sufficiency and the ecological loss of local genetic controls on plant breeding. However, in a wider scheme of cultural ecology ‘Seed Journey’ can be viewed as an experiment in the development of ‘open commons’ for living sustainably in the context of free trade and consumer capitalism spreading the rule of law, the enhanced use of critical reason, the expansion of individual freedom and the tolerance of diversity. The big question is how to turn the progressivist rhetoric about decent housing, efficient healthcare systems and better schools into cosmopolitan unity through intensified commerce and free access to digital media and computer networking. Open commons is a term that is unique throughout Europe. It encompasses all types and aspects of digital common property. Urban development in the context of open commons can inspire more participatory governance through the creation of digital cultures that provide knowledge about our existence as inhabitants of cities and as citizens of the world. We all need to learn about the past of our living space, so that we can “own” it and propel this identity and local knowledge into the future. In particular local digital cultures based on open commons allow citizens to gain ownership of the urban environment, and to meet and learn from one another. In short, a culture of open commons in the context of placemaking is a means through which citizens feel they have an interactive niche in the humanised urban ecosystem. This kind of culturally sensitive approach to IT can counter tribalism and empower marginalized individuals and communities to participate in social and political life. In other words, organizations and movements built on digital media and led by citizens strengthen and leverage capacities for collective empowerment and action that can shape politics, not just policy. However, social media users who can claim to have hundreds of friends in their network, sometimes find it difficult to name half a dozen people that they have actually met in their local neighbourhood. While social networks have helped people to meet like-minded contacts online, they have had a more limited role in developing face-to-face place bonding in communities. But gradually, social networks are beginning to have a bigger role in building community connectedness on the ground and catalysing neighbourhood co-operation and social action. Connectedness has to be the key to living a full and rounded life. The concept is much larger than family. Modern physics recognizes the whole universe as a web of dynamic relationships of which humans are but a tiny outcome. It is within this grand cosmic perspective that a capacity to signal out special places to make connections was crucial to launch the primal social order of indigenous peoples. In a practical sense, choosing meeting places to make connections with nature and others is part and parcel of healing the fundamental disease of our time – the fragmentation of the world and knowledge about it into isolated parts. Piecemeal knowledge is not useful at a time when the real task is to understand and redress the extensive destruction of the life systems of planet Earth brought about by human single- mindedness. By putting ourselves in the perspective of the rest of reality, human self- consciousness enables us to discover the humiliating truth that the entire world does not revolve around us as human beings, and never has. The moment of recognition comes when we realize that for almost all of geological history, humankind has not existed and has thus been irrelevant to the rest of the universe. If in addition we begin to see ourselves, not just as other people see us, but as all the other species of the natural world view us, as just another animal relative, we suddenly find ourselves in a very broad biological perspective. From a religious viewpoint, this recognition of our real place in a big scheme of things, where our uniqueness is only that we make stuff and accumulate it provides a dramatic moment of humility and of possible conversion to a way of thinking about ourselves as part of the body of the universe, showing reverence to all life. Above all, we belong to places and places do not belong to us (Fig 2). We are by nature a migrant species, and we should mark and celebrate our places of arrival and departure. There are some places in every country that have a particular significance for particular groups of people, because their ancestors have built kinship networks. Sacred or holy places are found in different cultures, past and present, all over the world. Such places are frequently marked or embellished by architectural structures and art. 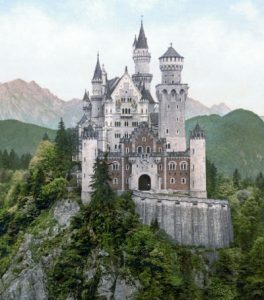 In most cases, it can be shown that the sacredness of a place is linked in some way to natural objects and features such as trees, stones, water, mountains, caves, and forms in the landscape. It can further be shown that these natural objects and forms lie at the root of the forms and shapes employed to mark or embellish a sacred site. In this context, my religious standpoint in all this is that the development of modern science has made incredible much of the content of traditional belief of religions, based on a supernatural god. Sacredness and spiritualism without God means that the quest for transcendent living is satisfied in nothing else but genetic demand for inner and outer order that evolved the concepts of ‘intelligence’, ‘love’ and ‘free being’. Silence and contemplation are not just for monks and nuns, they are natural functions of human biology. The idea of a public, social place outside of home and work has been around for centuries, but it didn’t enter the lexicon as a “third place” until the phenomenon was thoroughly explored by sociologist Ray Oldenburg in his 1989 book, “The Great Good Place.” . The concept of third places is frequently cited in professional discussions of topics ranging from community and social connections to the importance of place. Separate from first place (home) and second place (work), third places have taken on a new lustre in recent years as companies discover the value of third places inside the office: cafés and casual spaces where employees can sip coffee, tea or even a beer, and connect with colleagues in a relaxed, informal environment. Third places are face-to-face phenomena. The idea that electronic communication permits a virtual third place is misleading. “Virtual” means that something is like something else in both essence and effect, and that’s not true in this instance. When you go to a third place you essentially open yourself up to whoever is there. And they may be very different from you. If you don’t know your neighbours, you will be suspicious. And if you are suspicious, you will act accordingly. You don’t get neighbourly on that basis. If you spend time with people you’re not going to hate them, it’s just that simple. Nevertheless, social media users can harness the interactivity and connectivity of social networking sites to create a sense of place in a digital environment. There are people who argue that regularly scheduled Twitter chats can function as digital third places, sites of online sociality that both mirror and deviate from physical gathering sites, such as bars or clubs. Using Oldenburg’s eight characteristics of (built) third places, apply to people who collectively identify with others and collaborate in digital gathering sites supporting the idea that social networking sites offer the potential for continued thinking about the role of third places in developing connectivity online. Moreover, further opportunities for the study of space—both physical and digital—and the study of time as integral components of digitally mediated interpersonal connection. Geographical places and their physical features are sites of memory where landscape operates as a storehouse for collective memory (Fig 3). The bonds between place and identity influence our pastimes, our policies and our politics. Bonding memory with place involves the association of emotionally striking memory images within visualized locations. Persons desiring to train this faculty of memory must select places and form mental images of the things they wish to remember and store those images in places of the mind. The aim is that the order of the places will preserve the order of the things, and the images of the things will denote the things themselves. Metaphorically, places and the images are employed respectively as a wax writing-tablet and the letters written upon it. The ‘method of location’ is a general designation for remembrance techniques that rely upon memorising spatial relationships to establish, spatial order and aid recall. In this technique the subject memorizes the layout of some building, or the arrangement of shops on a street, or a video game, or any geographical entity which is composed of a number of discrete loci. When desiring to remember such a set of items the subject takes a mental ‘walk’ through these loci and commits an item to each one by forming an image between the item and any distinguishing feature of that locus. Retrieval of items is achieved by ‘walking’ through the loci, allowing the latter to activate the desired items. Recalling a memory inevitably involves the consideration of time passing. In the everyday places of the countryside and city, we may discern texts embedded in scenery that are capable of revealing important truths about society and culture, present and past. Views singled out from a wide topographic context contain subtle clues about the history of the place. Smaller pictures from the original image focus on particular objects, unfolding a story, as if it were written on the land. Old stumps, derelict walls, field undulations and the form of walls and trees, take on new meaning. For example, in a woodland, the age and cause of tree scars and the size of rocks in stone walls tell of past land use, while the variety of tree species and sizes links the site to changing systems of agriculture and industry. Then there is the form and iconography of buildings. Science, storytelling and history come together in a picture using the themes of time, memory and place comparing ‘then’ with ‘now’. In 2013 Ferris Jabr produced a paper for ‘Scientific American’ entitled ‘The Reading Brain in the Digital Age’ in which he highlighted the fact that most screens, e-readers, smartphones and tablets interfere with intuitive navigation of a text and inhibit people from mapping the journey in their minds. In particular he pointed out that a reader of digital text might scroll through a seamless stream of words, tap forward one page at a time or use the search function to immediately locate a particular phrase—but it is difficult to see any one passage in the context of the entire text. As an analogy, he invited the reader to imagine if Google Maps allowed people to navigate street by individual street, as well as to teleport to any specific address, but prevented them from zooming out to see a neighborhood, state or country. A map is not just a peek at the future but is a method of gathering, ordering and recording knowledge. In this connection, all maps are to some extent the products of imagination. No map is ever the truly objective description of a place that it purports to be. Every map is shaped – and coloured – by political, cultural and social conditions, and by the personal experience or imaginative projections of its maker. Maps are works of art that can be enhanced by imaginative embellishments, they can show imaginary places, and artists can adapt map iconography to express their ideas and experiences of place. We can truly say that the digital age has promoted the use of mapping tools in their many expressions as amazing tools to record, organise, recall and comment on visual thinking. In human evolution visual thinking came long before language. An early imperative for all visual beings must have been to compare one place with another in order to select elements of the environment that aided survival. In this process, the memory capacity of hominids probably evolved to compare ‘then’ with ‘now’ as part of keeping records to cope with the need to coperate in large society, increase pro-sociality and reduce defection even among strangers (Fig 4). Record keeping, at first by refinement of visual memory, then by transcribing memory in writing, helps to solve the problem of cooperation in ethnically diverse, ultrasocial polities by transcending the limitations of human cognition. Memory systems of reciprocal exchange facilitate the tracking of heterogeneous interactions and storing the information to guide future reciprocal behaviour. They facilitate reputation formation and maintenance in large group living by providing a record of people’s past behaviour and reputational status. Third, they promote the construction, transmission, and maintenance of social norms and associated moral punishments in large groups. Finally, they expedite the creation of increasingly large and salient group identities by standardising, storing, and transmitting identities across previously distinct social groups. An example of this is the Suffolk community wiki which identifies villages, now an homogenised collection of county postcodes, as ancient settlements within an Anglo Saxon tribal area where they were known collectively as ‘ the people of the River Blyth’. In days before maps village and tribal boundaries were seared in the memories of the inhabitants. They now exist in virtual reality . New digital imaginations of the urban environment can transform citizens’ sense of place and sense of self. For example, since 2009, the Open Commons Linz initiative has made available a wide variety of “free” data: geo-data and statistical information having to do with city life, local government, recreation and tourism..
Open commons refers to digital common property that’s freely available to all citizens, who are permitted to use it under certain predefined conditions and without major impediments. The mission of the Open Commons Linz platform is to responsibly provide the general public with access to such digital content—i.e. digitized music, pictures, photographs, videos, data, literature, radio plays and software. The core module is the Linz Open Data initiative that coordinates the process of preparing and making available data produced by government agencies, whereby these data can then be reused free of charge. More than 50 applications of these data have already been developed. Free WLAN is already available at more than 200 locations in Linz and in all public transport throughout the city. This is designed to facilitate participation in the digital domain and mobile working. Expanding availability is now focusing on squares and parks, community centres, libraries, recreational facilities, swimming pools and other municipal institutions and cultural complexes. Few municipalities in the world provide inhabitants with infrastructure that delivers such comprehensive coverage free of charge. A map and a list of all available hotspots are online at http://hotspot.linz.at . To enable citizens of Linz to not only consume content but to create and share it the Public Space Server makes 5 GB of Web space available free of charge to all locals—thus, a practical commons of cloud-based data storage. This server also provides free access to applications such as a webmail programme and a convenient way for users to create their own website and participate in open forums. Used to work in engineering after serving an apprenticeship. Then became a full-time book dealer selling rare & collectable books. Got involved in building websites, affiliate search engine marketing and contextual ads. Called it a day and went all but retired at the age of 39. Which sees me where I am today – living life simply and only for my own pleasure really. This means I shouldn’t complain – but frequently do on this site. The site mixes, hopefully, both humour and, dare I say it, some depth. Historical based stuff is clearly more serious though not too ‘dry’ I hope. Other articles are done somewhat tongue in cheek, there’s a lot of irony, some obvious some more subtle – generally it’s self-deprecating, the joke’s on me even if sometimes, superficially, it may not appear so. The site has grown and grown over the years and last year it averaged 1.8 million hits a month! At our height we were experiencing 3million hits a month but it was unsustainable so I deleted a lot of ’stuff’ and steered the site in another direction. It takes quite a bit of managing at times. If you see me out-and-about or at an event then please do say hello. It’s always a pleasure to meet anybody who visits the site. Do leave a comment and take part, it’s a friendly place and you don’t need to be an expert . . .Which is just as well because I’m not! Wellow Abbey is an example of one of the site’s topics, which between 2010-15 elicited 129 comments. Its deliberations can still be seen, using the following link. (Fig 5 ). The Abbey probably had an important role in the economy of medieval Grimsby. But, there is very little archival material available about its local impact, which no doubt adds to the allure of the topic to amateur historians. Although the geographical site of the abbey, close to the town centre is well known, it is now occupied by a small housing estate built over it in the late 1960s. 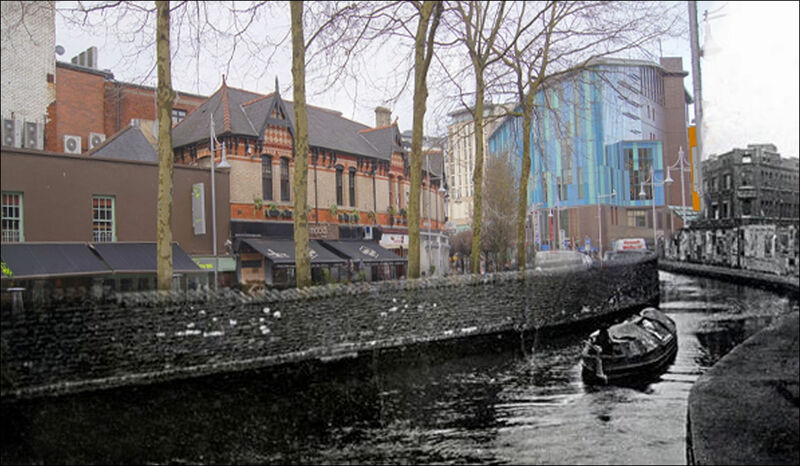 Indeed, the town has had several makeovers that have been unsympathetic to the town’s built heritage. Through people accessing a local digital commons, Wellow Abbey and its monks live on in a virtual place visualised in the minds of the few on line visitors who have added their comments to the forum and a much larger number of Internet users who have searched the web or stumbled across the forum whilst surfing. New imaginings have been set in motion giving the web participants and viewers a sense of place without depending on a pictorial archive and where there is nothing to see on the ground. The digital arena of the abbey has been expanded by some contributors to the forum to include personal reminiscences of their real life experiences which were associated with the abbey. I can add one of my own, which took place during the Second World War, when a bomb hit 5 Abbey Drive West on the night of 19th August 1940 killing Frederick North aged 55. Visiting the devastation the next day my Aunt Millie Bellamy, who resided in Abbey Road, a few metres away, saw an angel hovering above the crater. So it is that digital memories of place become embedded in virtual reality. 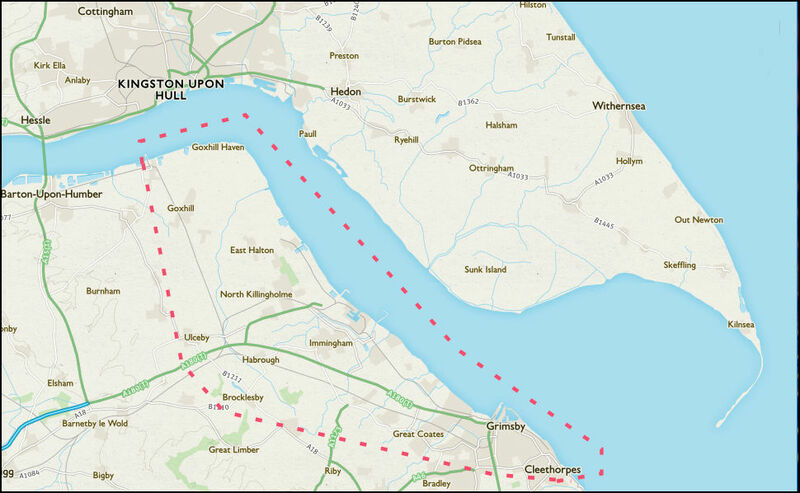 Grimsby, like so many post industrial towns is topographically placeless. For its inhabitants any sense of place comes from within their consciousness. 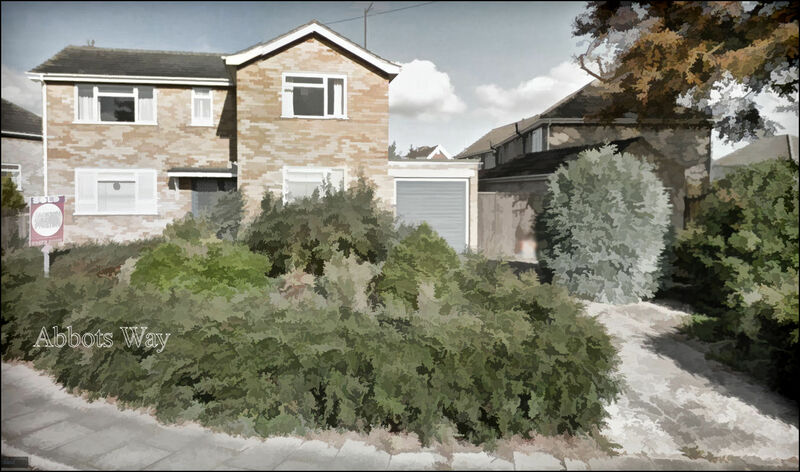 Perhaps we should call this kind of mental visualisation a spirit of place because it is the combination of characteristics that gives some locations a special ‘feel’ or personality. There is a spirit of mystery in a name, like Wellow Abbey emanating from a locus in the built environment. In this situation, environment is not external and the feeling is internal. “Environment sounds external to us, but it is not. ….. There is no space outside of space….Location is based on one thing’s relationship to something else There is no external grid “. Albert Einstein was the first person to realize that empty space is not nothing. It is now thought that the material universe is embedded in dark matter through which we live and move as part of Earth’s solar system. In this model our place in the universe is but one structural element embedded in a solid cosmos of dark matter. It is our mental processing that positions us in the cosmos. In the context of the use of IT in Linz, Grimsby and Blything as aids to placemaking, social media is an inherently conversational tool. Its strength lies in its ability set up places in the minds of individuals and to forge new paths of communication and collaboration between them, and between organisations, individuals and nature. Successful use of social media to establish a sense of place therefore depends on the extent to which individuals adopt a dialogical model that recognizes the participatory, collaborative and networked possibilities social media can offer. Social media can be used simply as a new tool for showing pictures sending and receiving email, announcing events and providing information about who you are. But it also contains the potential to move beyond these activities towards new forms of knowledge co-production, cooperation and collective action to establish interactive connections between people and things in the universe. In 2016 the shortlist for ‘Artes Mundi 7’ brought together, competitively, six international contemporary artists who directly engage with everyday life through their practice and who explore contemporary social issues across the globe. 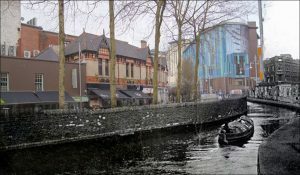 They presented their messages through the agency of installation artworks in the Welsh National Museum in Cardiff, which hosted the Artes Mundi 7 competition. Each artist brought their own unique perspective to present stories that explore what it means to be human in contemporary society (Fig 1). Whether introspective and deeply personal or engaged with broader social and cultural issues, each artist demonstrated the importance of art and culture in our everyday lives. Their stories challenged our preconceptions of the meanings of culture and ecology, to open up new ways of engaging with the future survival of a globalised society with seriously failing ecosystem services. Storytelling was once the most ambitious mission of Western painting. Renaissance artists told the life of Christ and the saints using sequential panels on the walls of churches. Michelangelo presented the sweeping drama of the Old and New Testaments across the vast expanse of the Sistine Chapel Ceiling. Closer to our own era, Diego Rivera celebrated the struggles of the Mexican people. However, with the rise of abstract modernism, the storytelling impulse among artists seemed to disappear, dismissed as exhausted, irrelevant, or embarrassingly academic. But the drive toward narrative, and an art audience’s fascination with stories, have resurfaced in recent years, often in video, but more evocatively in installations, which invite comparisons with developments in contemporary fiction—shuffled chapters, meandering plot lines, mash-ups of genres, and elusive or unreliable narrators. Installation art is a story telling practice and a catch-all term that describes any arrangement of objects in an exhibition space. This could vary from a room full of sculptures to a space filled with video monitors. What sets an art installation apart from sculpture or other traditional art forms, is its emphasis on a total, unified experience, created by an individual or a group rather than a display of separate, artworks of individuals. Art installations also tend to veer towards the experimental, aiming to shock or unsettle the viewer. The term installation first came into use in the 1960s to describe the way in which an exhibition was laid out, hence there is an emphasis on the artist as curator. The artist curated exhibition was particularly popular with Minimalist artists who were acutely aware of space and the ways in which their work related to it. Their work was often sensitively selected, arranged, or installed, to create a dialogue with its surroundings in order that viewers could take in both their work and its environment as one overall, immersive story. Documentation of this work was often referred to as an ‘installation shot.’ and the art work is archived as a series of photographs. Artes Mundi 7 showed clearly that artists working today continue to explore the possibilities of installation art and blur the boundaries between arrangements of art objects, the display of museum artifacts and their inclusion in installations. Also, the challenge for the installation artist, as opposed to the filmmaker or writer, is that he or she is free to choose from so many mediums to realize a completed project. These range from text, video, sound, ready-made props, photography, conventional approaches like drawing and sculpture, to occupying the great outdoors. No longer do works of art exist solely for the sake of our experience of them. Artists are creating a discourse; critiquing society and culture through their art. Installation art takes the aesthetic experience away from formal unity. The viewer has to tackle a new kind of disjointedness created by the juxtaposition of diverse multimedia elements. What is expected of the viewer of an installation often goes beyond the demands of more traditional art forms. The experience can be either an exhilarating mental trip or an exercise in frustration because the meanings of the objects and their contribution to the overarching story are not always obvious. Inevitably the baffled visitor seeks a written description of the artist’s message or finds a gallery attendant who is in the know. As an aid to creativity, many artists who make installations start with a two dimensional mind map of their story. The narrative is then told graphically by making connections between facts or concepts, which are expressed as objects, created, or selected, for presentation as a three dimensional display. The goal of the mind map is to make the items all cohere in a gallery or museum setting, and in the viewer’s mind. Definitions of an installation and a mind map are interchangeable. Both arrange words, ideas, tasks, or other items around a central key word or idea, and are used to generate, visualize, structure, and classify ideas. The common aim is to aid the study and organisation of information, communicating it to solve problems and pointing out ways of taking action to improve a social condition. Artes Mundi 7 brought together six social themes reflecting on ‘the human condition’. This document is the response of a visitor who selected one of these works , ‘Seed Journey’, to build a personal mind map out of the experience, and curating it on line to extend the story as an internet webquest. As an exercise in cultural ecology it can be taken as an educational legacy of Artes Mundi. Curating is often seen as a mediation between artist, work, and audience, with the curator firmly at the centre. Artists working with installations are increasingly realising the importance of providing detailed information to the gallery to ensure that aspects such as size, placement, and technical specifications of the installation art are understood. This provides parameters within which artist and gallery maintain a consistency to the installation each time it is shown. The artist can therefore be described as the primary curator. The central role of artist as the curator in charge of the process of selection and placement has thereby been further emphasized, because he or she has to work directly with the institutional and physical limitations of museum or gallery spaces. Because the viewer can enter a three dimensional space created by the artist, an installation can be visualised as a microcosm of the human ecological niche. Of the six social themes presented as Artes Mundi 7 installations ‘Seed Journey’ is the one that connects directly with the future survival of Homo sapiens. It taps into a vital thread of human history that began with the origins of agriculture in the Near East, where the process of domestication can be attributed to multiple centres, with the eastern Fertile Crescent playing a key role. ‘Seed Journey’ was produced by Futurefarmers. Futurefarmers is a multi-disciplinary collective headed by Californian artist Amy Franceschini. The collective was founded in 1995 as, a group of art and farming practitioners A consistent line through Franceschini’s work reveals sustained questioning about how “nature” and “culture” are perceived. Since 2013 Futurefarmers have been leading the Flatbread Society, a project centred on the creation of communal spaces in which people from diverse cultures gather to make flatbread. ‘Seed Journey’ focuses on the very seeds of grain used to make bread that were brought to Europe from the Fertile Crescent thousands of years ago. 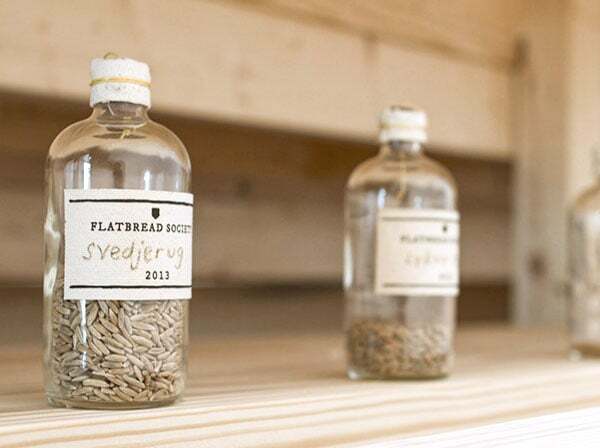 The seeds have been “rescued”, grown and distributed by the collective since 2013 from a range of sources, such as seeds saved during the Siege of Leningrad and those discovered by archaeologists in an abandoned sauna in Hamar, Norway. 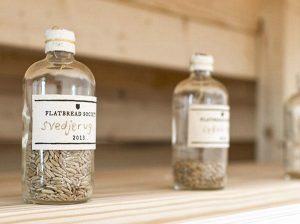 As part of Artes Mundi 7, in an act of reverse migration, Futurefarmers are taking these seeds by sailing boat from Oslo to the Middle East. 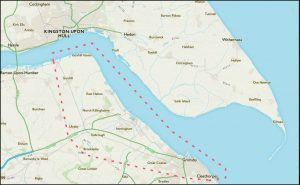 They will stop along the way to meet like-minded farmers, artisan bread makers, and organisations, and to collect more seeds; Wales is one of these ports of call. Regarding the historical objective of the voyage, the prehistoric settlement of Chogha Golan on the eastern edge of the Fertile Crescent is a key archaeological site dating to the end of the last Ice Age roughly 11,700 years ago. In horizon II of the Chogha Golan dig, dating to 9.800 years ago, domesticated emmer wheat appears. Over a period of two millennia the economy of the settlement shifted toward the domesticated species that formed the economic basis for the rise of village life and subsequent civilizations in the Near East. Plants including multiple forms of wheat, barley and lentils together with domestic animals later accompanied farmers as they spread across western Eurasia, gradually replacing the indigenous hunter-gatherer societies. Many of the plants that were domesticated in the Fertile Crescent form the economic basis for the day to day survival of world population today. Since at least the time of the Roman Empire the human population of Europe has eaten mass produced grain, some of which was stored to guard against bad harvests. Over the centuries supply has risen with human demand but the storage margin has always been relatively small. For example, during the 1980s and early 1990s global grain reserves averaged about 100 days of consumption. The peak of 130 days was reached in the mid 1980s. Since then, grain reserves have declined, when measured by consumption, through the first decade of the 21st century. More recently global grain reserves have averaged only about 70 days. The world has eaten the grain surplus of history and now eats crop-to-crop regardless of the size of the U.S. corn crop, which supplies between 40-50% of the world demand. Alongside this trend there has been a decline from state-owned strategic grain reserves, in favour of a more market-oriented approach that is dominated by a handful of powerful multinational corporations who maintain sophisticated supply chains. Because data on the amount of food these corporations hold in storage are proprietary secrets, it is really impossible to assess how resilient or vulnerable this makes the global food system. This is brief account of the geopolitical background to the Seed Voyage installation. This can be taken as a critique of the massive technological investments in seed banks, because the associated concepts of living sustainability are really maintained and developed through living networks. The seed carrying vessel Christiania has become a “laboratory” where the collective continues its research. The Seed Journey installation is therefore an interactive “base camp” and visitors are invited to become part of the journey and to consider the possibility of social change and different futures. In this context, Futurefarmers are interested in preserving ‘the commons’ as it relates to land use, biological matter and the sharing of knowledge. Therefore, Seed Journey can be seen as a gesture towards the relatively recent cultural departure of humanity from self-sufficiency and the ecological loss of local genetic controls on plant breeding in relation to the impossibility of the human condition returning to a Neolithic way of life. Seeds are now a vital element of Earth’s natural capital. Starting from the first view of an artwork, the brain begins to work backwards seeking to touch the mind of the artist who created it. The viewer attempts to trace its origins in the mental processes of the maker, thereby acquiescing to the brain’s natural preference to scan a visual space in a non-linear fashion. The viewer transcribes what comes into the mind as a two-dimensional tree-like diagram. This mind map enables him or her to more easily sort through different details and recognize relationships among these details. Mind mapping is a natural expression of what the brain does to allow a person to organize and understand information faster and better. It is an expression of radiant thinking, which helps unlock the mental potential of the brain to interact fully with the complexities of the environment . 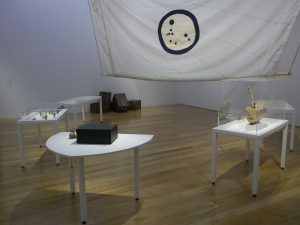 It is argued that there are important alternative spaces of meaning to be developed through the creation and placement of an installation between object and audience. The archiving of an installation like Seed Journey, as a mind map, gives the creative act more permanence than an ‘installation shot’. Digital curating, in particular, allows for greater audience participation, both by expanding the potential audience and by allowing visitors to navigate through virtual galleries under their own direction. By facilitating visitors’ creation of their own visual arguments, a new level of audience participation in visual analysis appears and a fundamental intellectual and intuitive aspect of curating is made possible. The transcribing of Seed Journey as a mind map web quest is actually a research activity. The objective is to explore how digital resources can be used for storytelling at its most basic core as an art practice using computer-based tools to create interactive mind maps encompassing digital documentaries, computer-based narratives, digital essays, electronic memoirs, interactive storytelling, etc. In general, all these creative acts revolve around the idea of combining the art of telling stories with a variety of multimedia, including graphics, audio, video, and Web publishing. This meditation on Seed Journey deals, in general, with the dependent relationships existing between different parts of the environment and the human beings who inhabit it. The environment has the ability to affect the individuals and groups living in its midst. In particular, it asks what role is given to environmental agents, such as domesticated wildlife and political events, that people attribute to the forces of the world that surrounds, invades or abandons them? Whether an agent is an object or an event, it is defined as something with the ability to initiate or influence human lives in its close surroundings. A cereal seed is one such agent of change that produces an aesthetic type of satisfaction from contemplating its role in everyday life. Probably this is why the spread of domesticated seeds was promoted as an aesthetic experience by Futurefarmers. A narrative of change demonstrates how a feeling of community emerges through experiencing a shared aesthetic of the human ecological niche. The human niche is the ‘space’ that humans as a species utilize and transform to survive and reproduce. It is largely sociocultural, constructed and enacted within, across, and by social groups and societies. John Dewey’s major writing ‘Art as Experience (1934)’ has had a great influence on contemporary work in everyday aesthetics. Dewey suggested that the experiences of aesthetic exaltation associated with art can be traced back to processes that pre-date art and that both humans and other animals partake in. Aesthetic experience, according to Dewey, is on a continuum with the deep feelings of fulfillment that arise from interacting with the commonplace environment i.e. the human ecological niche, to satisfy one’s needs. He says an aesthetic experience can belong even to simple experiences like that of lifting a stone, as long as it is done with sufficient attention. Dewey’s view is thus highly amenable to the application of aesthetic concepts throughout everyday life where they build feelings of well being into a sense of place . Art valued for its beauty does not enter into Dewey’s world. Dewey held that the sources of aesthetic experience are to found in sub-human animal life. Sense of place is a behavioural expression of the modern human ecological niche which reflects the structure and functioning of human societies and the long term transformation of local environments. Here, aesthetics is an essential part of the social processes by which communities are formed and value their environment through associating knowledge, reflexivity, and communication. In this sense, it is a matter of seeing which types of aesthetic, or ethical, challenges are at work in making and contemplating community environments. These are the physically existing environments in which characters live and move. We may call them “settings,” but this intuitive notion of setting needs to be further refined. In the theatre, we can distinguish the stage on which events are shown from the broader world that is the setting alluded to by the characters. In a written/visual narrative we can distinguish the individual locations where narratively significant events have taken place from the total space implied by the sum total of these events. It is the individual locations and the wider behavioural setting that constitute the human ecological niche within which people gain sustenance and other necessities, It comprises complex social relationships among unrelated and unknown individuals. Thus, a narrative of change is the product of evolution by natural selection acting on individuals and groups via modes of sociocultural niche construction. Perception of cultural heritage has a big part in developing a sense of place. It has already been pointed out that Amy Franceschini’s work consistently reveals sustained questioning about how “nature” and “culture” are perceived. Her contribution to Artes Mundi 7 uses the domestication of seeds to illustrate the need to value and conserve global natural capital and so equlibrate culture with the productivity of ecosystems. 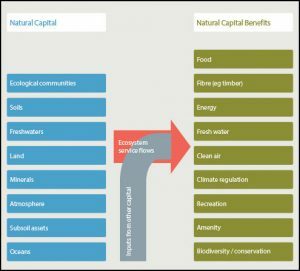 Natural Capital can be defined as the world’s stocks of humanity’s natural assets, which include geology, soil, air, water and all living things. It is from this Natural Capital that humans derive a wide range of cultural services, often called ecosystem services, which make human life possible. The most obvious ecosystem services include the food we eat, the water we drink and the plant materials we use for fuel, building materials and medicine (Fig 3 ). There are also many less visible ecosystem services such as climate regulation and natural flood defences provided by forests, the billions of tonnes of carbon stored by peatlands, or the pollination of crops by insects. Even less visible are aesthetic ecosystem services such as the experiences of joy and wonderment we take from wildlife and the natural landscapes. Non-use value – preferences to protect a natural capital asset for the benefit of others who are using it now (altruistic value), for future generations (bequest value) and for its own sake (existence value). Economic analysis does not make a judgement about which motivation is more ‘valuable’ Rather, in an aesthetic encounter with an environmental agent it enables relative values to be measured by looking at what individuals are willing to give up for the thing they value – the more they are willing to give up, the more valuable the thing is. Where what’s given up is money, expressing value in a monetary economic context has the advantage of comparing like with like within the framework of financial and other costs and benefits aimed at maintaining natural capital assets (Fig 3). Therefore, the seed-bearing vessel Christiania is freighted with much more of value than cereal seeds. She carries the educational seeds of an interdisciplinary knowledge system for overcoming the barriers to living sustainably. Effectively, overcoming such barriers requires commitment by society as a whole to sustainable development. Such commitment would involve all of society’s stakeholders to work collaboratively and in partnership, to develop policies and processes which integrate social, economic, cultural, political and conservation goals. To advance such goals, a curriculum reoriented towards sustainability would place the notion of citizenship among its primary objectives. It has to be recognized that many of the world’s problems, including environmental problems, are related to our ways of living, and that solutions imply transforming the social conditions of human life as well as changes in individual lifestyles. This draws attention to the economic and political structures which cause poverty and other forms of social injustice and foster unsustainable practices. It draws attention to the need for people to learn the many processes for solving these problems through a broad and comprehensive education related not only to mastery of different subject matters, but equally to discovering real world problems of their society and the requirements for changing them. This kind of orientation would require, inter alia, increased attention to the humanities and social sciences in a curriculum for living sustainable. The natural sciences provide important abstract knowledge of the world but, of themselves, do not contribute to the values and attitudes that must be the foundation of sustainable development. Even increased study of ecology is not sufficient to reorient education towards sustainability. Even though ecology has been described by some as the foundation discipline of environmental education, studies of the biophysical and geophysical concepts are a necessary – but not sufficient – prerequisite to understanding sustainability. The traditional primacy of nature study, and the often apolitical contexts in which is taught, need to be balanced with the study of social sciences and humanities. Learning about the interactions of ecological processes would then be associated with market forces, cultural values, equitable decision-making, government action and the environmental impacts of human activities in a holistic interdependent manner. A reaffirmation of the contribution of education to society means that the central goals of education must include helping people learn how to identify elements of unsustainable development that concern them and how to address them. We all need to learn how to reflect critically on our place in the world and to consider what sustainability means to us and our communities. People need to practice envisioning alternative ways of development and living, evaluating alternative visions, learning how to negotiate and justify choices between visions, and making plans for achieving desired ones, and participating in community life to bring such visions into effect. These are the skills and abilities which underlie good citizenship, and make education for sustainability part of a lifelong process of building an informed, concerned and active populace. In this way, education for sustainability contributes to education for democracy and peace. You are currently browsing the Cultural Ecology blog archives for January, 2017.